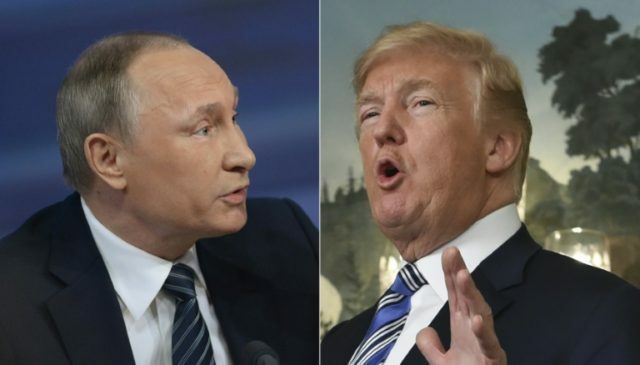 Moscow (AFP) – Russian President Vladimir Putin said that dialogue with Donald Trump could be “constructive”, in comments released after his US counterpart called for Russia to be re-admitted to the exclusive Group of Seven club of nations. Trump is “a serious-minded person who knows how to listen to people and respond to their arguments,” Putin said in a Russian television interview, the full version of which will air Saturday. “This leads me to believe that dialogue may prove to be constructive,” the Russian leader added. Trump, before jumping on Air Force One to fly to Canada which is hosting the G7 summit, called for a return to the body’s pre-2014 “G8” formula. Moscow was expelled from the rich nations’ club, which sees itself as a guarantor of rules-based order and the global economy, over its 2014 annexation of Ukraine’s Crimea region. And on the sidelines of their summit, European leaders scrambled to agree on a common position strongly opposing Russian re-admission. In early April, Kremlin aide Vladimir Ushakov said Trump had proposed a meeting with Putin during a telephone call. US-Russian relations have been hit by years of disagreement over the Syrian conflict, Russia’s annexation of Crimea and its involvement in eastern Ukraine. Trump’s decision to pull the United States out of the 2015 Iran nuclear deal is another bone of contention.